Before the beginning of time, before the gods and people lived upon the land, all lived beneath the sea - "Tir fo Thuinn" - Manannán's land beneath the waves. Eiocha - ancient Celtic Goddess of the Deep Waters - is a white mare made of sea foam - born on the shore between the land and the sea. Eiocha ate the white berries (mistletoe) - the tears of the sea - that grew on a giant oak tree on the shore, and then gave birth to Cernunnos the Stag God. Together they made the sacred mare Goddess Epona - who created horses in memory of Eiocha. 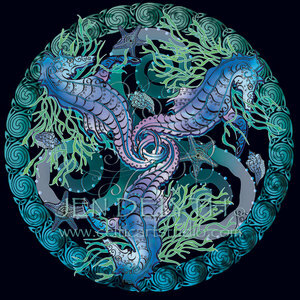 The sea horse represents strength and creativity - as they change colors when threatened, and with their strong tails wrapped around the seaweed and sea plants, they resist the pull of the tide and currents..